TouchSurgery by Kinosis was one of the first surgical simulation apps available on mobile devices and is leading the way in mobile surgical education. 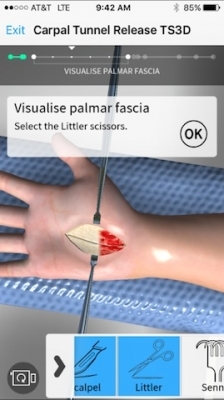 This surgical simulation app is changing the way surgical techniques are taught and enhancing surgical education among surgeons and non-surgeons. We have previously reviewed the app back in 2013. Since then, it has recently undergone a significant upgrade improving the look and design. They have also added lots of new features and content. The app is free to download and anyone can use the app. Medical personnel, however, can verify their professional status through their Doximity profile. 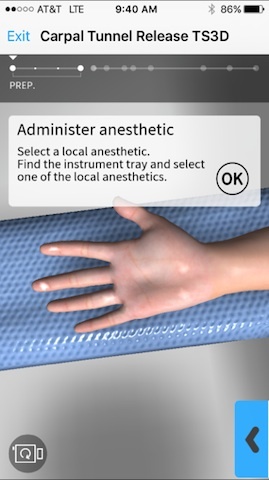 Once an account has been created, the user has access to many different surgical simulation modules. One of the most exciting updates is the 3D module. This module enhances the realistic feel of being in the operating room by creating a 3D surgical environment. The user can tilt and rotate their mobile device to move around the operating field. This creates a virtual reality through the mobile device that really enhances the app environment. This orientation also affects how the user performs the operation. Just as in the real OR, the user may need to tilt or move the mobile device to change their perspective to perform a specific task. The 3D carpal tunnel module is very impressive. They have streamlined how instructions are presented and broken the module down into a timeline at the top of the screen to group the main stages of the procedure. The user has several new ways to interact with surgical instruments. The ability to pull retractors or use self-retainers is illustrated with hand icons. This is a great improvement over the previous drag and match feature moving a green circle to a purple circle in earlier module designs. TouchSurgery continues to use their testing feature to provide feedback and assess the understanding of the various procedures. A nice improvement is that the app allows the user to create their own sequence of events when performing a procedure. Previously, the process was very linear and did not allow for surgeon discretion. Now, for example, if the user forgets to inject local at the beginning of the procedure, they can proceed with the procedure but are penalized at the end. This allows for greater assessment of a student’s understanding of the procedure. The “My Progress” section allows for quick review of their success in completing the various modules and analyzing which modules may need more practice. This is a great tool for junior residents to assist their preparation and learning of a procedure before performing it in a skills lab or operating room. The feedback can be very high-yield and clinically applicable. 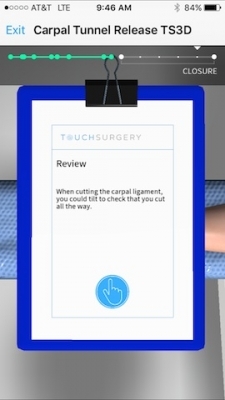 It was interesting to get feedback on the 3D carpal tunnel module noting that I could have tilted the mobile device more to confirm my cut of the transverse carpal ligament. This is something we commonly teach to junior surgeons learning this technique, but I did not realize I had the capability to be that interactive with the app during this module. I have never seen a mobile app so accurately capture the nuances of a surgical procedure like TouchSurgery’s new 3D module. Beyond the 3D environment, the app has also added content to “My Stream”. This section of the app is tailored to the user’s medical interest, presenting new modules and research updates in that specialty area. The user can bookmark and share this content with colleagues and friends. The graphics and anatomy are very impressive and do a wonderful job of recreating the operating room environment, however, the 3D module creates a new level of reality that enhances the surgical simulation. 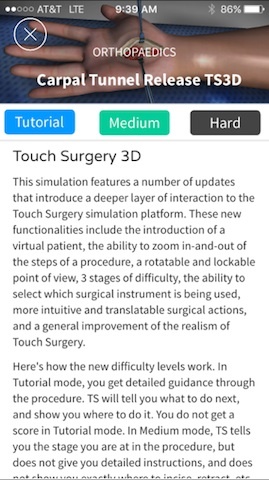 Combined with the feedback and stream of specialty content, the TouchSurgery app continues to lead the field in mobile device surgical simulation. We look forward to seeing future content and modules using this 3D module design. Excellent graphics and user interface. 3D module creates an even more realistic surgical simulation. Great tool for trainees to prepare for and understand cases. The filter for a surgical specialty is not maintained when reloading the app. Limited gestures for interacting with surgical instruments. The “My Stream” feature can be a little scattered in the content it provides. This continues to be one of the best orthopaedic and surgical apps I have seen within the app store. 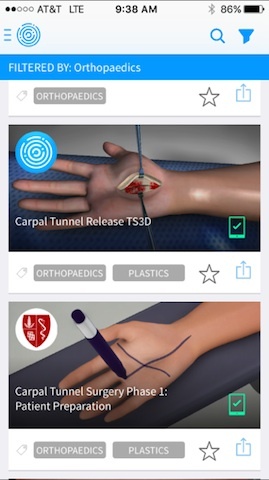 The app is a great resource for surgical trainees to learn about a wide range of procedures. The graphics and realistic simulation are truly amazing and separate the app from similar simulators. The content is very well organized and accurate. This is a must have app for surgical trainees. App is organized well and easy to navigate. The content on the My Stream could be tailored more or follow a teaching program for that specialty area of interest. 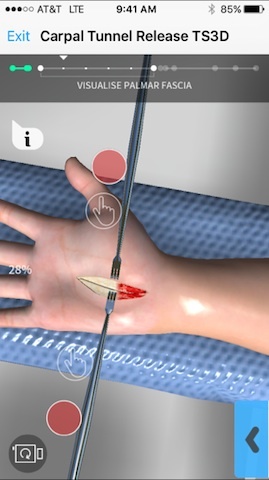 Great use of multimedia and graphics–this continues to be the most realistic surgical anatomy seen in an app to-date. 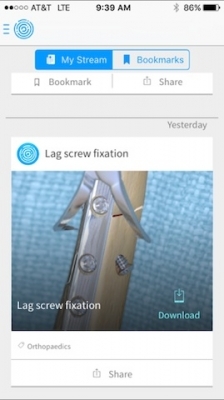 This app can be extremely useful to medical professionals, trainees, and patients, however, it provides only one technique for performing procedures. There are sometimes multiple techniques or methods for accomplishing these commonly presented procedures. Nathan Skelley is an orthopaedic surgery resident at Washington University in St. Louis/Barnes-Jewish Hospital. He was born and raised in Joplin, Missouri where he developed his interest in mobile health technologies and orthopaedics. After attending Cornell University, where he majored in Science and Technology studies, he earned his medical degree from Johns Hopkins School of Medicine. Nathan Skelley works to integrate mobile health technologies in his treatment of orthopaedic sports injuries.